Last Year Mariko Izumi introduced the WFN viewers to a Crappie and Smallmouth guide, Jeremy Colvin, on an episode of ?Hookin? Up?, when she visited Nashville and Dale Hollow Lake. I have since followed the career of this up and coming angler, featuring him in a blog a few months ago I called ?Pro-file? Jeremy is a hard working anglers fishing as a tournament competitor and continuing to guide in Tennessee and Kentucky. Jeremy being a husband and father also makes his accomplishments stand out at his young age of 34. In this blog I want to share his progress with you and introduce you to his partner Ralph Riley as well. Jeremy tells me that they have added the WFN logo to their tournament jerseys to show their support of the network. 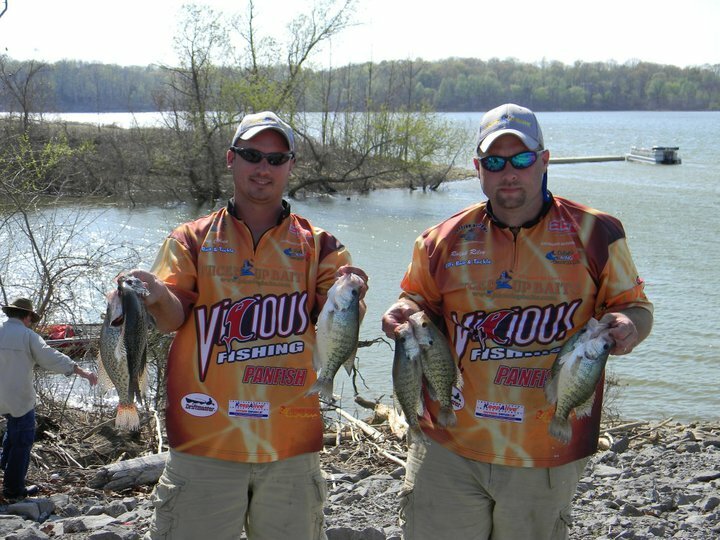 A few weeks ago on April 9th Crappie USA had a qualifying event on Barren River Lake in KY. This was the second tournament of the year that Jeremy has fished, following the previous week where he finished 22nd in his first pro tournament, not bad considering that he was competing against some of the best crappie fishermen in the country. Jeremy said, ?It was still not acceptable by my standards. I knew me and my partner were better than that and that it would take a better effort to get where we knew we were capable of finishing.? 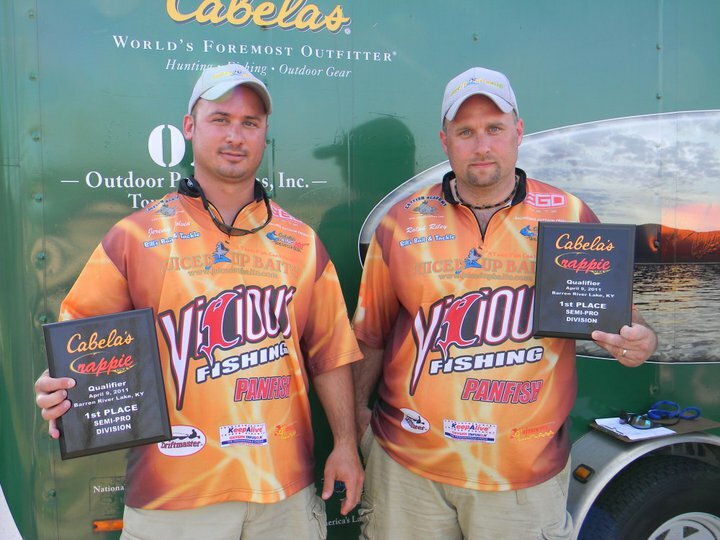 Jeremy and his partner, Ralph Riley of www.juicedupbaits.com were determined to figure out what they needed to do. Several days before the tournament while scouting, they found some staging fish and felt that these would be the fish it would take to win. However conditions changed and the water drastically warmed up before the tournament. The team pre-fished the day before, but the fish they had found had moved! Starting all over the day before the tournament, the two split up and searched the rest of the day Ralph then called Jeremy and said he had found some bigger fish holding on some trees that had fell into the lake caused by a landslide. This was an advantage as, no one else knew of the spot. With the first cast of the morning Colvin pulled in a big female from the spot and some smaller fish after that but couldn't?t produce any additional quality bites. Jeremy and Ralph then agreed that the bigger fish may have moved to shallower water, so they fished shallower on the same spot and ended up catching over 200 keepers. Jeremy reports that started the day with 26 dozen minnows and by the end of the day they had about 18 minnows left. With that much bait used and still catching several additional fish with jigs made by www.attackpakfishing.com . The two won the tournament by 2.2lbs over the second place finishers. They adapted to the constant changes and were successful. ?I hope this is the start of something really good for us.? Colvin said. Winning this event qualified the team for the prestigious Crappie USA. It is my suggestion that you keep your eye on these two in the next couple of years. As I have said in other blogs, I believe that these two young men will continue making a name for their selves in this sport. Join me in wishing Jeremy and Ralph the best of luck in the 2011 season.